Savitri is Founder of Homefyndr, a personalized home search app that utilizes machine learning to help people find home based on personal interests/needs, social habits and smart time-saving on daily commute. She also leads the Sydney-based Boomworks’ User Experience team in the quest to define robust, intelligent, and well-researched customer experiences that meet the needs of both the intended audience and the business. Prior to this, Vivid was Associate Creative Director at frog in Munich as well as V.P. and Creative Director for Trigger in Shanghai, where she was responsible for managing and running a mixed-culture studio that specializes in games, mobile apps and touch media. She has worked on games such as Evil Dead, The Adventure of Tintin, The Karate Kid, District 9 ‘MNU’ alert and many others. She is a designer by trade with more than 8 years of experience using major design application packages for both the web and mobile platforms. Some of her clients include Sony Pictures, Warner Bros, Disney/Pixar, Lucas Film, Universal Studios and Paramount. Before Trigger, Vivid worked as a Creative Director and Chief Designer at Design San Frontieres in Shanghai and was also a Senior Designer at Wieden+Kennedy and Firefly Studio. 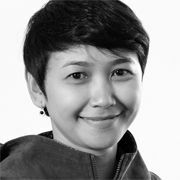 She has also been a guest lecturer at Hong Kong University and a freelance feature writer for the Jakarta Post. Her work has garnered several accolades including the People’s Choice Webby Award for 2010, W3 Awards, Pixel Awards and Dope Awards. Most recently, she won the Contagious Scholarship, a rigorous competition with applicants from more than 15 countries that awards the winner with partial tuition to the Berlin School of Creative Leadership. Vivid received her B.A. in Communications Science at University of Padjadjaran in Indonesia and attended a summer creative writing course at Stanford University.